The twenty-second edition of the Forum of Private Business Health and Safety guide will be available for our members from week commencing 8th April 2019. It is a vital business resource for any business owner not only our members and it will give you peace of mind to know that you will be fully up to speed and compliant when it comes to managing your legal health and safety obligations. Our guide is simple and easy to use checklist format that will help to identify where you are already legally compliant and it will point out where you may not be compliant. A new section has been added to this years guide found under Occupational Health which around First Aid/Mental Health. One in four people in the UK will have a mental health problem at some point. Whilst mental health problems are common and most are mild, tend to be short term and are normally successfully treated with medication by a general practitioner. Mental health is about how we think, feel and behave – anxiety and depression are the most common of mental health problems which at times are a combination of personal and work-related factors. All businesses need to be considering how they handle situations with staff members that may be going through a hard time. Does your business have procedures in place to help your staff? 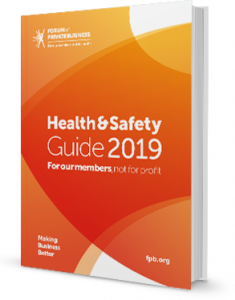 Our Health and Safety Guide 2019, one of the most important guides for business, forming part of the Forum’s comprehensive support package to help members comply with legislation. Find out about other guides that the Forum has available. If you would like to know how you can obtain a copy of our latest Health and Safety Guide 2019 or how to become a member can benefit your business visit you can call our membership advisors on 01565 626001.